If you are interest in seeking job opportunities with the country’s most progressive banking institution Bank Alfalah Limited. So you are at the right path to get the latest updates about the Bank Alfalah Jobs and upcoming opportunities, or apply for specific positions listed under Vacancies. 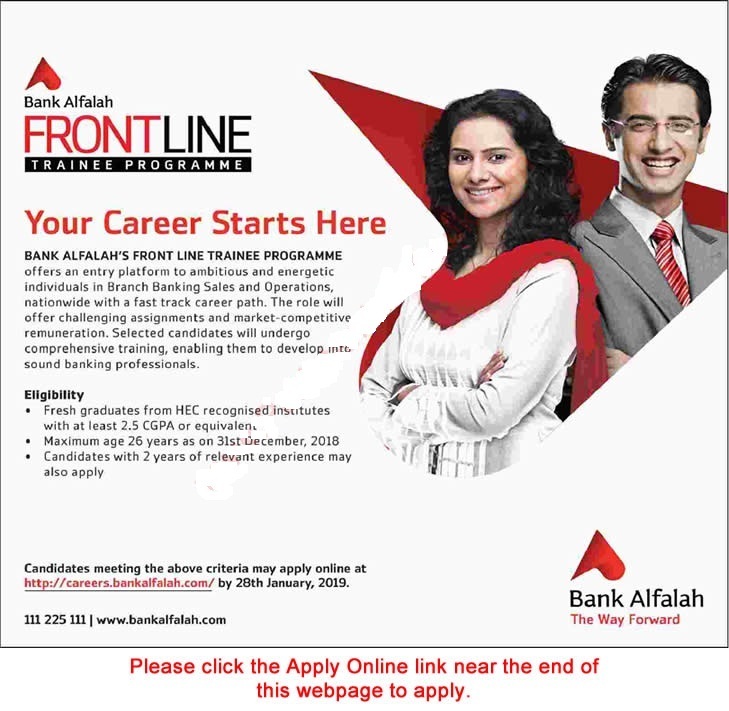 We are providing update now that Bank Alfalah has invited the application form from the interested, well qualified, highly talented and self-motivated Pakistani nationals Male and Female candidates those are fulfilling the eligibility Criteria and Skills requirements for appointment against the following posts on permanent basis For Recruitment of Service Ambassador, Front Line Trainee Officer. Your CV will be scrutinized and routed to the most suitable positions relevant to your education, experience and exposure. So you must submit you CV to the Bank Alflah to get the jobs and avail the career opportunity this time and next too. You must Submit application form before the closing date because after closing date you miss this opportunity and Last of application form submission is Jan 29, 2019. Bank Alfalah will called for interview or test Only shortlisted candidates after the test interview clearance candidates will be contacted to joining. But one thing candidates remember that No TA/DA will be paid for the selection procedure or test / interview. We advise to the candidates that they must bring their original documents At the time of the interview. This position is responsible for producing high quality service by facilitating our customers visiting branches, assisting them in the transition process from conventional banking to digital banking in order to improve the overall customer experience.